John Tweed statue of Kitchener, and one of the Rifle Brigade statues . The sculptor John Tweed is best known for his several prominent public portrait statues of military men, and for war memorials. He was born in Glasgow, and studied there at the Glasgow School of Art from 1882, also teaching there from 1888. He came to London in 1890, working for Hamo Thornycroft from the following year – Thornycroft seems to have had a lasting influence on his portrait statues – and went to Paris for a period from 1893. There, he befriended Rodin, but was never quite a student of his. Back in London, he lived off Chelsea Embankment on Cheyne Walk, next door to the contemporary painter Philip Wilson Steer. 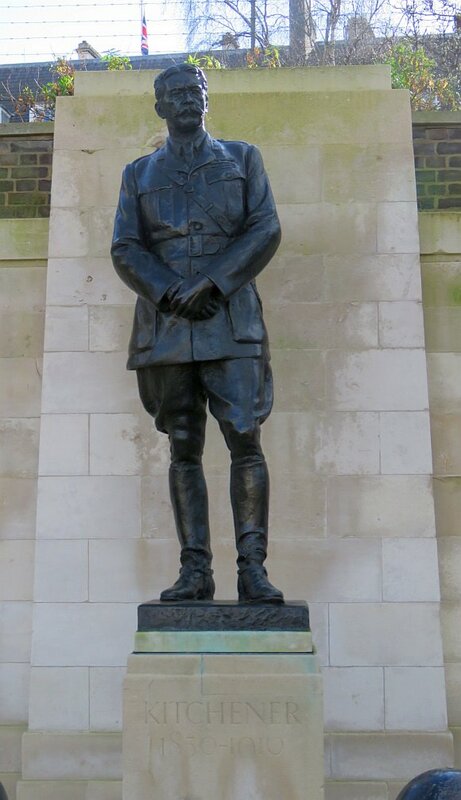 Tweed’s portrait statues, typically of military chaps, typically stand erect and straight-backed, stern-faced and looking ahead purposefully into the middle distance. Spielman, the critic, commented that Tweed aimed ‘rather at strength than at refinement...he has to some extent sacrified elaboration of modelling to vigour and emphasis’, which neatly encapsulates his style. In London, Tweed has one equestrian bronze, to Field Marshall George Stuart White , in Portland Place, with the sleek, youthful and relaxed horse contrasting well with the rather old and craggy and stiff-backed Field-Marshall (see more pictures of this statue on this page), and a notable statue of Clive of India on King Charles Steps (off Whitehall alongside the Foreign Office building) facing onto St James’s Park. 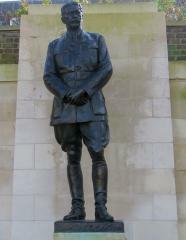 Close by on Horseguards Parade is Tweed’s statue of Lord Kitchener , another crisp military figure. An example of his war memorials is close to Victoria Station in Grosvenor Gardens: the Rifle Brigade memorial , with two standing soldiers. 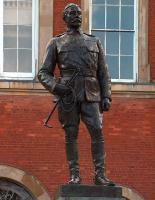 Baron Chesham statue in Aylesbury . Outside London, a less formal statue of a soldier is Tweed's King’s Royal Rifle Corps memorial in Winchester, and a slightly rumpled portrait statue, another soldierly one, is his Baron Chesham at Aylesbury, and we might also mention the statue of Joseph Cowan , a local MP, as an example of his non-military pieces, in Newcastle. 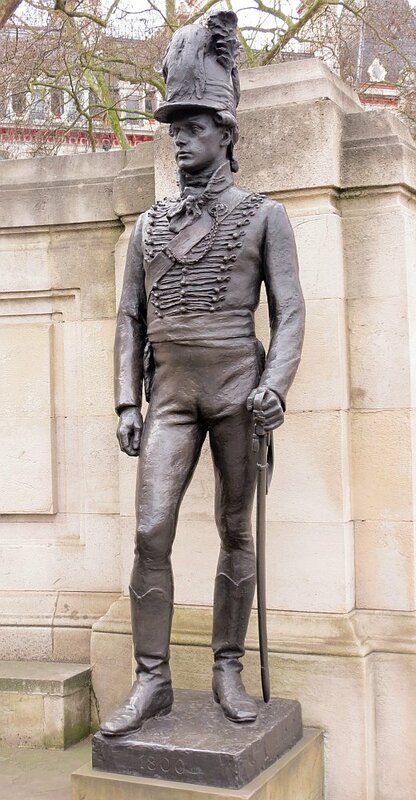 Tweed had much success in winning commissions for portrait statues across the British Empire, his principal works including a Captain Cook for Melbourne in Australia, the Marquis of Londonderry for Durban, South Africa, Cecil Rhodes for Bulawayo in Zimbabwe, the Earl of Ronalsdshay for Calcutta, and Queen Victoria statues for Madras and for Aden. Tweed also made some considerable number of portrait busts, with examples being in the collections of various national museums. He also did produce some ideal works, including a few nudes, examples of which are in the collection of Reading Museum and Art Gallery in Berkshire. Perfectly decent, but this was not really his speciality.